Online orders can now begin! Coaching the Pattern Read 4-3 Defense is ready to order. Please be aware that the shipping rate can only be guaranteed for United States Domestic orders only. Digital downloads are available through itunes or by clicking on the "Click to Order Link" above. Having coached with Keith Albers and watching him produce two All-American receivers in the same unit I can testify to his ability to teach young men the game of football. His talent for bringing out the best in his players is exemplified in this book about the pattern-read 4-3 defense. There is no doubt this book will be a valuable aid to coaches at every level of football. Sorry to keep dropping you messages but your book has me so excited. I swear to you, I was getting frustrated at myself for not comprehending coverages....hell I am an offensive line guy...I have coached everything BUT DB's so I still felt intimidated talking coverages and techniques with that position. I heard you lecture in Feb and knew I wanted to explore it furthure but did not follow thru. After geting frustrated with my DB coach at what I was seeing for our version of cover 4 and other adjustments. I took out 3 of your videos I had purchased and watched them. I liked what I was hearing but it still was not clear to me. I was missing the defending the pass DVD. (the vendor did not have it at the time of purchase) . I went online to Glazier and found the webinar lecture you gave and that is when it clicked. I knew I was going to do this. THat night, I ordered the missing video and the ebook and hard copy book. The next day implemented it like I said in my earlier post. After the competition, I went up to my players on defense and asked them about it and everyone one of them were excited about it. That in itself got me pumped up so once again THANK YOU! 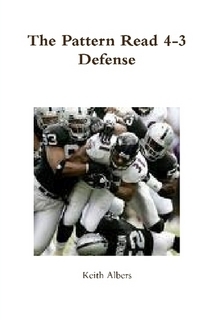 From novice to veteran coaches this book will make your 4-3 defense better. Not only will it create advantages for your players, but it is also easy to understand and implement. Keith has done an outstanding job writing this book. His expertise shines from concept to concept. This is a must read for 4-3 coaches looking to get the edge on their competition. I was very fortunate to have Keith on my staff at Knox College so I have seen first-hand his outstanding ability as a football coach and teacher. 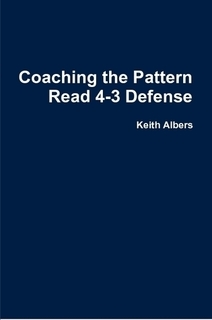 After coaching the 4-3 defense the last 18 years, I can say that I learned a lot and my eyes were opened to some new ideas and concepts from reading Keith’s book on the Pattern Read 4-3. I would recommend purchasing a copy of this book to anyone running a 4-3 defense at any level of football. Great work Keith!